We just had a pair of earthquakes near the town of Petrolia (first oil well in CA drilled here, ergo the name). The first one I did not feel, but I did feel the quick jolt of the second one. I will update this later, but for now, here is a map that shows the epicenter for these two earthquakes. I include the focal mechanism for the M 4.2 earthquake. The 3.3 was initially a 3.1 and the 4.2 was initially a 4.3. 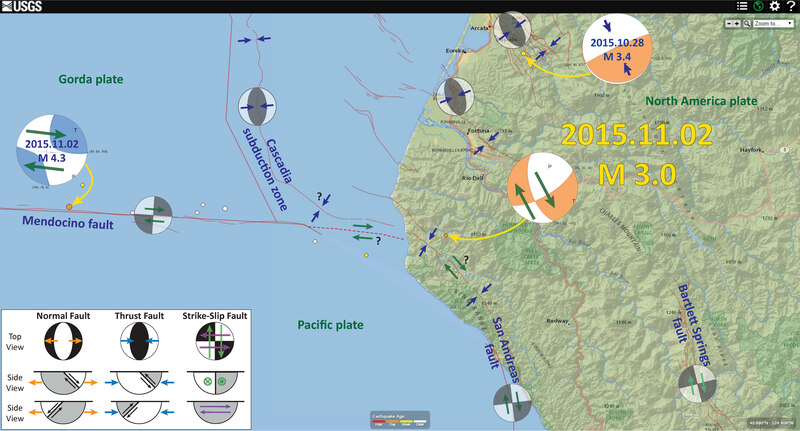 Interesting that we have had a number of earthquakes in this region, that have strike-slip senses of motion, probably associated with the Mendocino fault. If we get a moment tensor, it might show that this is also a strike-slip earthquake. We will just need to wait and see. Sometimes focal mechanisms and moment tensors show different types of earthquake motions. The depth suggests that this is in the downgoing Gorda plate. I would have thought this would have been in the North America plate, given the compressional focal mechanism. 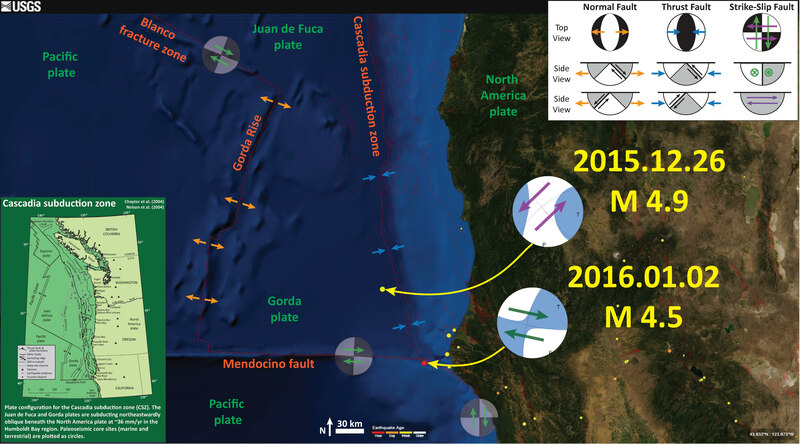 However, the San Andreas fault system (Sierra Nevada block) is causing north-south compression. This is leading to the highest uplift rates in the continental US along the King Range. Perhaps this north-south compression is being transferred into the GP in this location. Of course, the depth could be incorrect (though this is not an offshore eq, so the depth is probably not that bad). Very interesting focal mechanism. There is now a USGS moment tensor for this earthquake. I have updated the map to incorporate this. The orientation of compression from this moment tensor makes more sense given the convergence along the subduction zone. I will have to think about this a little more. The orig map is here. Also, the magnitude is back to a M 4.3. Take a look at the “Did You Feel iT?” map in the lower right corner. The region of Petrolia has the highest shaking intensity (using the Modified Mercalli Intensity scale). Head to the east, into the hills, the shaking diminishes. However, head even further east, note that the shaking increases again. Why do you think this is the case? Those polygons include regions in the Eel River Valley. This area is a river valley filled with sediments. These sediments tend to amplify ground shaking. Fascinating (in a voice from Spock of Star Trek). Funny, when the first quake hit, the USGS had a ? for the magnitude. Here is a screenshot evidence of that. Here is the seismograph from Jamie Wayne. A few days ago, we had a strike-slip earthquake in this area. Here is the earthquake report for that M 4.5 earthquake. Below is a map. I include a good review of the local tectonics on this page. 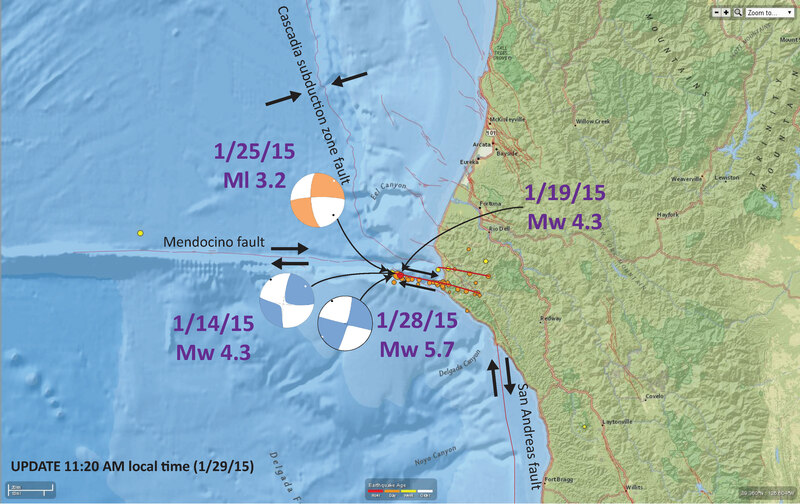 Here is my report that shows the seismicity aligning with where the MF may exist. 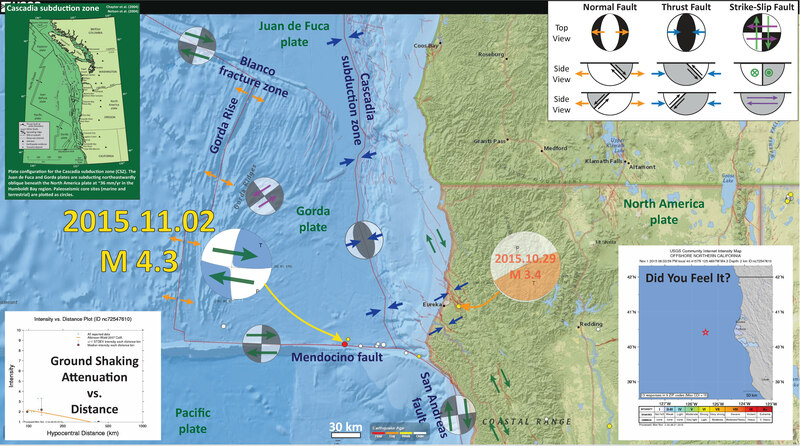 Below is a map from that series of quakes. Also, in April of 2015, we had an earthquake further offshore (M = 4.7). Here is my report for that earthquake. 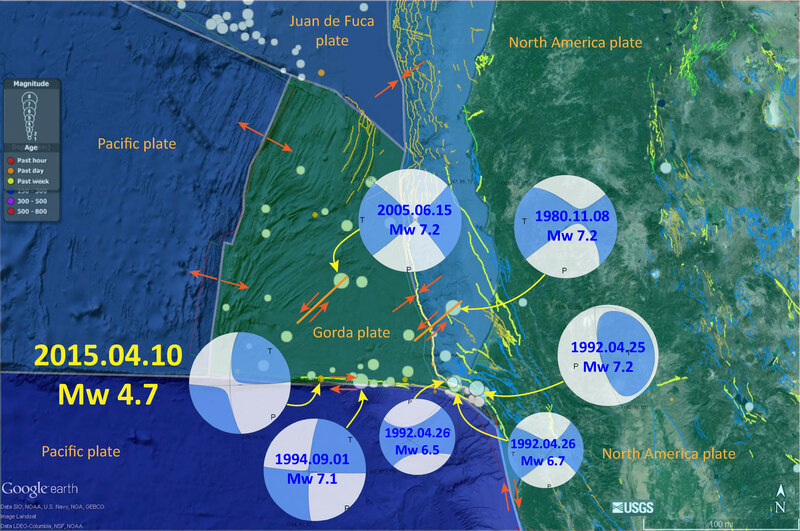 Below is a map that summarizes some of the earthquakes in this region from past few decades. A few days later, there was another eq along the MF (M = 5.5). Here is my report for that earthquake. Below is a map. 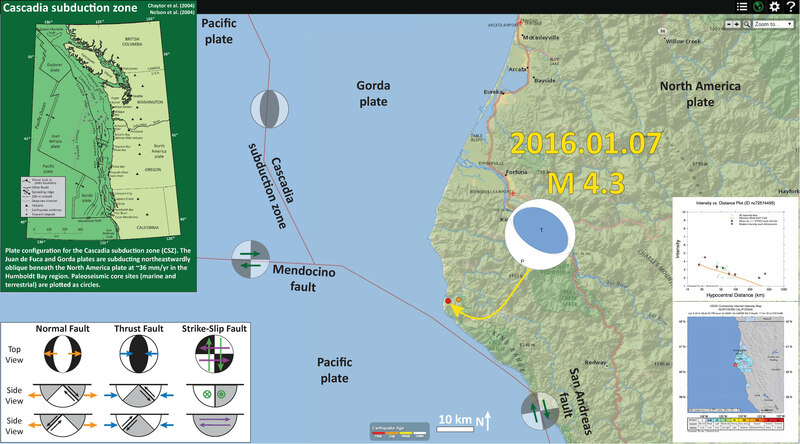 Then in November 2015, there was a M 4.3 earthquake. Here is my report for that earthquake. Below is a map. Here is the coolest of all of these earthquakes from the past year in this region. Here is my report for this M 3.0 earthquake. Below is a map. Here is a summary of recent seismicity for this region, along with a couple summaries for Cascadia in general.